The BoJ has been meeting its stated monetary policy objective of hitting approximately zero yields on 10Y japanese government bonds (10Y JGBs) with far less than the JPY80tr annualised rate of asset purchases for quite some time. So on that basis, the trimming of its asset purchases at longer maturities 10-25Y bonds and 25Y and longer today could be considered of marginal relevance. But that would be to totally ignore the signalling effect of this move. Such policy shifts do not occur without a great deal of thought, even if the activity itself is no longer a binding constraint on the variable being targeted - in this case, 10Y JGB yields. Furthermore, this change in BoJ operations takes place against the backdrop of a slight rise in yields globally; one might imagine the BoJ pushing back against this if it felt that it threatened their policy objective of zero 10Y JGB yields. Instead, they appear to have embraced the change. Rather than irrelevant, this move could be an important kite flying exercise by the BoJ, to assess the impact of any move towards policy normalisation - something that is being talked about more, now that growth has been at or above potential for seven straight quarters - and with promising signs of this continuing following stronger labour cash earnings figures today. 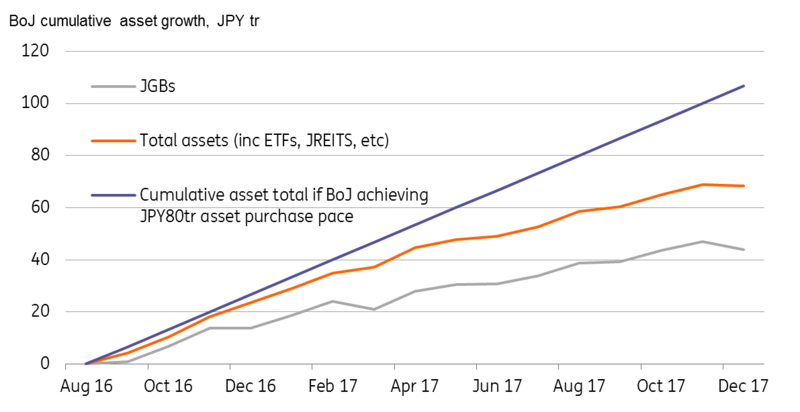 Indeed, the prospects of a meaningful taper of the BoJ's Qualitaitve and Quantitative easing (QQE) before the year-end increased markedly today. The yen has appreciated about 0.5% today on the news even though JGB yields are little changed. Further changes could well provide additional support to the JPY. We are forecasting USDJPY111 by end 2018. Clearly the risks to this forecast have grown today, with a much lower end-year figure now a possibility.